Only a few months are left till the end of 2018, so it’s a high time to finalize B2B marketing results and set the right strategy for the upcoming year. One of the biggest shift of this year is a finding that 90 % of B2B content marketers put their audience’s informational needs over their business needs. 10 years ago prioritizing customers’ needs was a novel concept, while now it has become a common practice among the most successful content marketers. 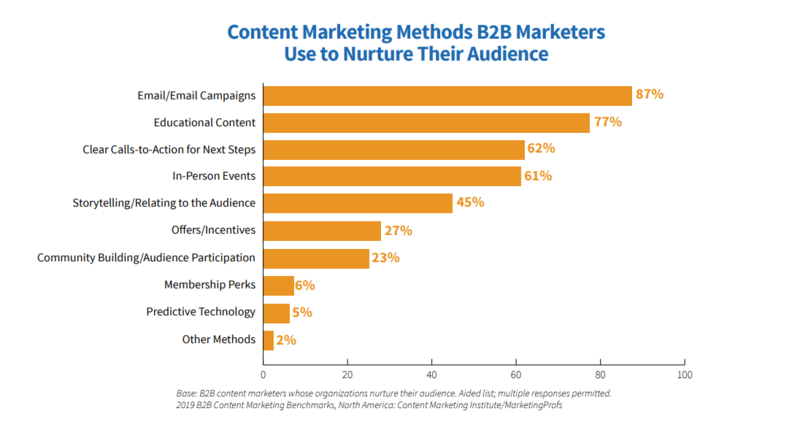 In this post, we’ve put together some of the most important highlights presented in CMI and MarketingProfs’ ninth annual B2B Content Marketing 2019 report that will be sure to help you succeed in B2B content marketing in 2019. According to the research, 65 % the most successful content marketers are far more likely than their less successful peers (14%) to have a documented content marketing. The content marketers believe that it aligns the team around a common mission/goals and makes it easier to determine which types of content to develop. 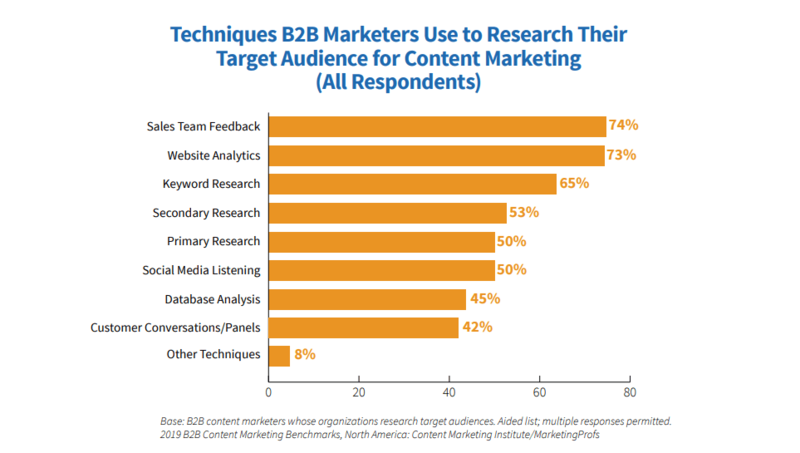 B2B content marketers use mainly top three techniques for reaching their audiences such as sales team feedback, website analytics, and keyword research. Thus, they improve marketing-sales integration, understand better their visitors and improve the content. Email campaigns and educational content are top 2 ways B2B marketers use to nurture their audience. However, it is important to keep in mind that audience’s preferences may change and content marketers should follow them. 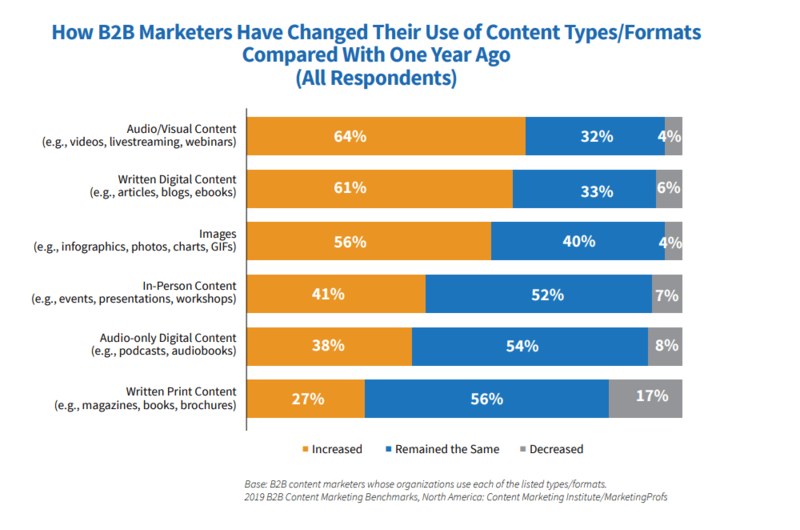 As shown in the chart, the majority of B2B content marketers (50%) increased their use of audio/visual content, written digital content, and images compared with one year ago. Some say that social media is stale. However, a research shows that 61 % of B2B marketers increased their use of social media for content marketing purposes compared with one year ago. The most popular social media platforms B2B marketers use are LinkedIn, Twitter and Facebook. 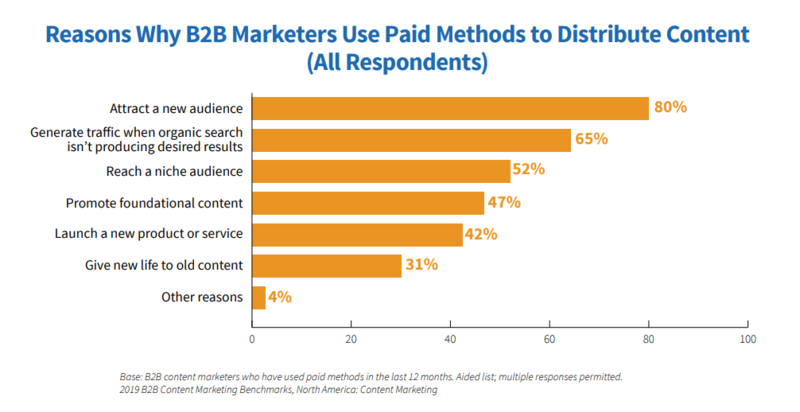 Two methods B2B content marketers use are sponsored content on social media and search engine marketing (SEM). The research has revealed that content marketing has helped B2B marketers, who have used it successfully over the last 12 months, to create brand awareness, educate the audience, build credibility/trust, generate demand/leads, and more. Consequently, 96 % of the most successful content marketers agree that their audience views their company as a credible and trusted resource. Content marketing is gaining more and more popularity in a modern marketing tactic. With so many powerful benefits it presents, it’s easy to see why a lot of businesses are applying this strategy. If you are running B2B software system, then you know how valuable integrations with shopping carts are. In our whitepaper “How to Market Your Integrations: Marketing Tips for B2B E-Commerce Vendors“ you will get know how to get targeted traffic to your website and convert prospects into real ROI without investing a budget.